Spent the weekend on the Island, as my friend Rachel invited me to give a guest lecture on stats in her research methods class1. On the ferry on the way over to the Island on Friday night I was pleasantly surprised to run into my friend Bronwyn, who I haven’t seen since graduation back in May. It was awesome having a chance to catch up with her and the ferry ride was over in a flash! Friday night, we just chilled, as Rachel had been teaching prior to picking me up from the ferry and we had to get up the next morning to teach. Teaching was fun, as I’m a nerd and love talking about stats and her students were very engaged – asked lots of great questions. I remember the same thing happening the last time I taught her class, but I’m always a little concerned when I start teaching about stats because many people aren’t stats-loving nerds like me, so I always fear having a room full of disinterested people staring at me. Happily, those fears were unfounded in this case. After my guest lecture, we grabbed lunch and then Rachel continued teaching while I went off to do a 11 km run2. And then we got to spend the weekend celebrating the survival of having worked on a Saturday. Celebrating included such things as getting to see Rachel’s adorable 21-month-old son (who had been asleep by the time I’d arrived the previous night), hanging out with some other peeps who were also visiting for the weekend, lovely wine, a delicious dinner, an amazing chocolate raspberry trifle3, and a rousing game of Apples to Apples (a.k.a. Wholesome Cards Against Humanity), at which I did disastrously bad. Today we spent a super relaxing day – had some breakfast, went to a beach in Parksville, lunch at a local pub, playing in the backyard, a walk around the neighbourhood, a delicious dinner – all of which time we got to spend catching up, which was awesome because it’s been a long time since we’d had a chance to do that. And now I’m heading back on the ferry feeling rested and relaxed! The part-time program, as scheduled, consists of a full weekend of classes roughly every third weekend, except July & August, plus work on a business plan and industry project that spanned several months and was done outside of class weekends. I took some courses from outside my program (e.g., full-time MBA classes offered in the evenings, EMBA courses offered on different weekends, some online/distributed learning courses). This makes my time spent in class less regular than it otherwise would have been. My industry project was a project that was related to work, so some of it was done on work time. Since this was work I’d have been doing anyway, it was not counted as school work time (Though anything I did that was extra for the industry project was conducted on my own time and is counted in the data). Transit time to and from school was not counted, unless I happened to be doing homework (e.g., reading while on the Skytrain) during that time. And now, to the juicy data! If my next best alternative use of that time was to do freelance work and I charged $100/hr as a consultant, that would mean my opportunity cost for that time was $147,2001. Now, because I, along with all my classmates swore to our business statistics professor that we would always graph our data, here are some swanky graphs (click to embiggen)! So, in conclusion, I spent a heck of a lot of time on the MBA program. However, you should note that this was my experience, but it differs from others. For example, I spoke to a classmate at graduation who told me that he spent 40 hours per week total, for the whole 28 months of the program4. And I’m sure there are students who spent less time and in different patterns, given what was going on in the lives at various points – a lot can happen in two and a half years! Basically, I’m pretty happy with my time allocation because while it was a huge amount of time and required a lot of sacrifice, I invested the time that was needed to learn what I wanted to and needed to learn, but I still managed to have some fun along the way5. But mostly, I’m happy that it’s done! 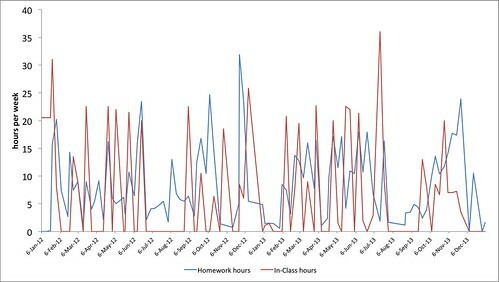 How Many Hours Does One Spend on Homework in a Part-time MBA Program? An Update! Since the core part of my MBA program is complete, I figured it was time to check in on my “time spent” data. 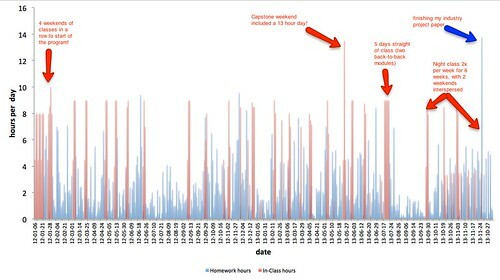 When last I looked1, I had been spending, on average, 17.7 hrs per week on school (including both time in class and time on homework), with a 0.87 hrs of homework per hour of class. Since then, we had the summer off from classes, but I kept clocking homework time as we worked on our business plan project during the summer. Then we had some more classes (and, of course, homework) in the fall. So, on average, I’ve spent ~15 hrs per week working on my program4, which is at the low end of the estimate I was given when I spoke to some program alumni before I started the program. It’s an insane amount of time, to be sure – it equates to about 2 extra workdays per week, so it’s like I’ve been working 7 days per week for the past 44 weeks5 – but no pain, no gain, right? I ended up getting a good mark for the core6 – and more importantly, I learned a ton of stuff. Now, no data analysis is complete without some beautiful graphs, right? 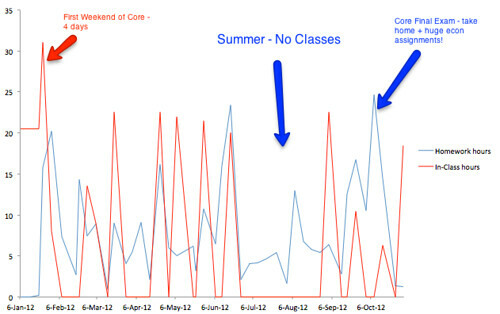 The red bars represent time spent in class, which you can see occurs roughly every third weekend, with a big cluster at the beginning when I had pre-core classes for the first three weekends in January and then a big gap over the summer, when we didn’t have classes. 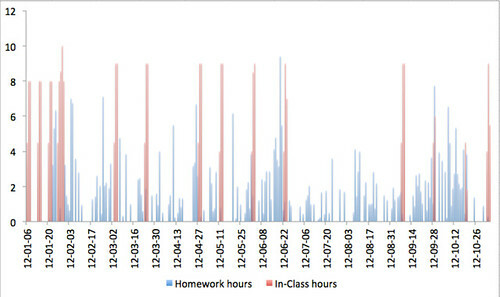 Blue bars represent time spent doing homework, which you can see varies a lot from day-to-day. Conclusion: workload for the program is highly variable. Variability, as I learned in Supply Chain Management class, is hard to manage. My stress level and rampant weight gain over the core program agree7! Tonight we start our first two post-core modules for the MBA – Business Stats and Business Economics. We’ve been told that the post-core is much more manageable than the core. Will this turn out to be true? Only time – and the data – will tell. 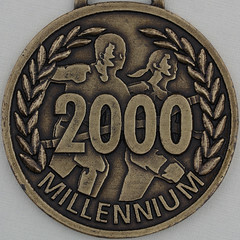 This is my 2000th blog posting! In celebration, I thought I’d share some blog stats. Because stats are the best way to celebrate things, right? Here’s to 2000 more postings about spider conspiracies, shenanigans, hockey hotties, and radicalized geese! Image Credit: Medallion osted by Leo Reynolds on Flickr.